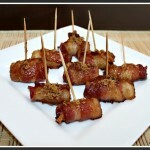 Bacon wrapped water chestnuts make a quick and easy appetizer idea. I love appetizers, I would eat them in place of a meal any day of the week! My mouth waters at the thought of the flavor combinations that appetizers offer, sweet, spicy, salty, and savory YUMMO! 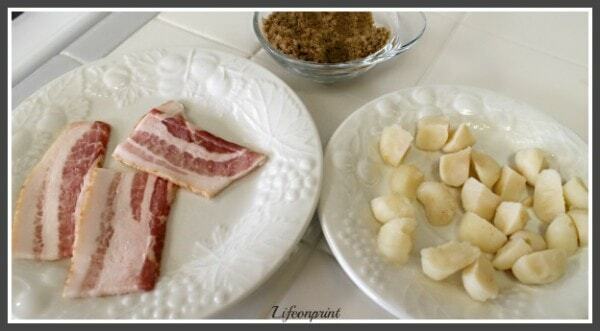 Simple and delicious appetizer recipe, a bacon lovers dream, 3 ingredients is all you need! In Hawaii we call appetizers “pupus” (I know, doesn’t sound appetizing to mainlanders, lol) give me a “pupu platter” and I’m in heaven! I’m also a huge fan of bacon (everything tastes better wrapped in bacon! ), that’s one of the reasons I love this recipe so much, besides the fact that it only take 3 ingredients, is so very simple to create, and leaves your guest craving more. No joke, every time I serve my bacon wrapped water chestnuts, they are the first thing to disappear and every time I ask what I can bring to a get together or a party, the request is always the same. So I decided to pass this well loved, super simple recipe on to all of you! brown sugar for sprinkling on top! 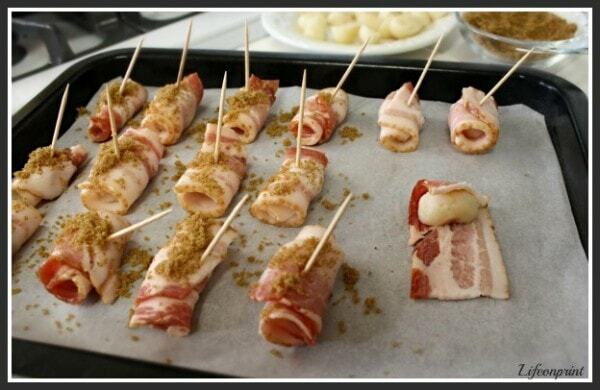 Place pan of prepared appetizers into oven and bake at 350 for approx 25-30 mins, or until bacon is done to your liking. When done, remove and let cool a bit, serve warm. Wow your guests during your next gathering with these tasty appetizers. 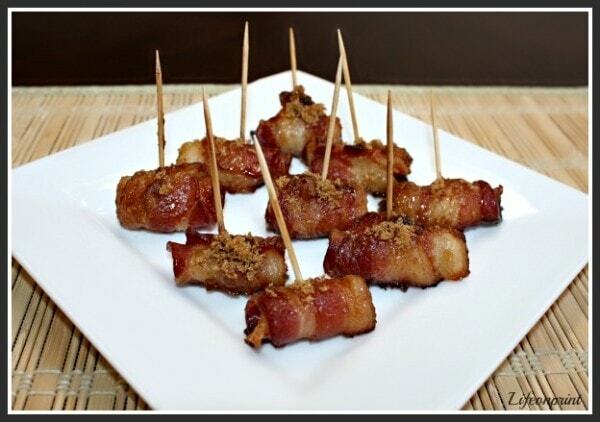 Bacon wrapped water chestnuts are a favorite among many. 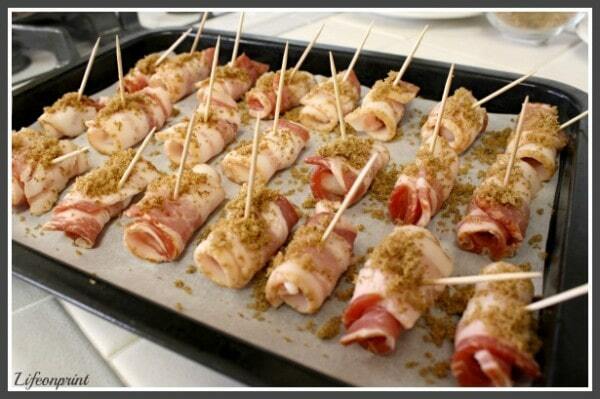 Place pan of prepared appetizers into oven and bake at 350 for approx 25-30 mins, or until bacon is done to your liking. 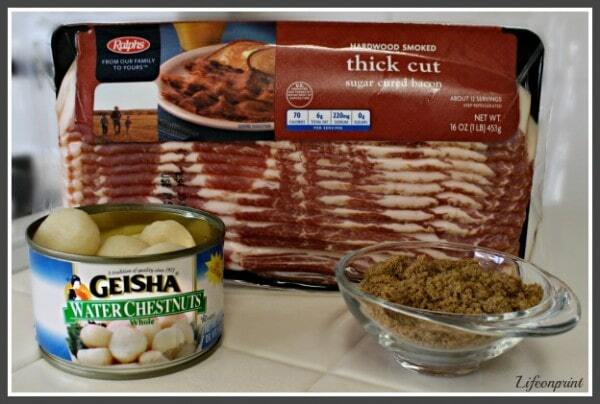 When would you serve bacon wrapped water chestnuts? This looks delicious. I would have to use turkey bacon, but I’d definitely try it. Thank you for sharing this recipe.